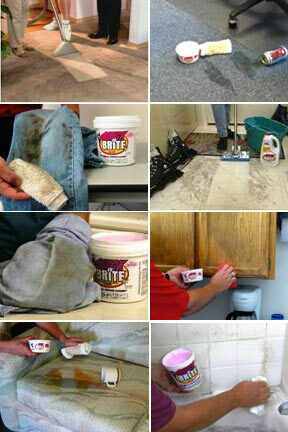 Clean your home safer and easier with Quick 'n Brite. This is the best all natural cleaner available and it works on hundreds of jobs and surfaces around your home, office and vehicle. It is incredibly easy to use and produces amazing results, yet it remains totally safe to touch smell or even taste. You can use it as a degreaser, stain fighter, window washer, tub and tile cleaner and so much more. This Jack of all trades is a master of many, so you will be thrilled at how effortless it makes cleaning thanks to the fact that it works so well on so many different types of dirt and stains. Most natural cleaners produce less than stellar results, and the ones that do work, only seem to work for one specific job. Quick n Brite is different. It will achieve professional looking clean in very little time while remaining completely safe and non toxic. This basic kit is a good place to start if you have never tried the cleaner before. It gets you some liquid and some paste so you can start discovering all of the great uses for this eco-friendy cleaning product. Use it all over your home for cleaning even the toughest stains, spills, and dirt. It works better than traditional all-purpose cleaners and it is totally safe for you and the environment. Stop using toxic chemicals to clean your home, and start using Quick 'n Brite. In the Starter Kit you get 1 - 32 oz. Super Shot Liquid Concentrate, 1 - 12 oz. tub of Paste, and 1 non-abrasive scrub sponge. Everything you need to get started cleaning with an all natural cleaner that really works. Or go for our Deluxe Kit and get more than double the cleaner for even more savings. Make 186 bottles of window cleaner or 37 bottles of all-purpose cleaner with one 32 oz. 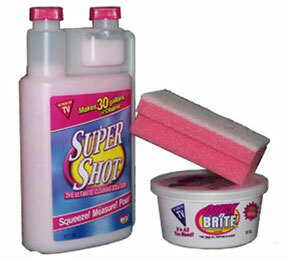 Super Shot Liquid Concentrate. Clean anything you can get wet with water! Quick 'n Brite is a highly concentrated, environmentally safe (phosphate-free) organic solvent for all your cleaning needs. Whether cleaning floors, autos, windows, or even your pet, it is perfect for any job! Use it for stain removal, as a tub and tile cleaner, for degreasing kitchen cabinets and stove tops, cleaning floors, and hundreds of other jobs all over your home. This amazing, all natural cleaner is all you need to clean your whole house. It contains no toxic chemicals, cleaning solvents, or harmful abrasives. It gets its tremendous cleaning power from a natural surfactant and it is totally biodegradable and environmentally safe. It has been tested by an independent lab, which concluded that the product was biodegradable and non-toxic. This means that it is entirely safe and requires no special handling like so many other household cleaners. There are no toxic fumes and it won't irritate your skin. Quick'n Brite is safe around children, pets, food, and will do no harm if it works its way into lakes and streams. With all of these benefits, it is hard to believe that this stuff would be so good at cleaning, but you will be amazed at how well this cleaner works and how easy it is to use. This is a concentrated cleaner, so it will last a long time. It is meant to be diluted based upon the job at hand, and for some applications, you may prefer the paste version over the liquid, and vise versa. A single teaspoon of Quick n Brite will make one quart of window cleaner, and it only takes a few tablespoons to mix up an extra strength all purpose spray. For other jobs you will want to use the cleaner full strength, but this gives you an idea of how long this amount might last you. The starter package includes both the liquid and paste versions of the cleaner. Both of these are full strength, the liquid is just easier for certain applications. It is best used for steam cleaning machines or for mixing and diluting into spray bottles. The paste is better used for set in stains or jobs that require more attention. To make full strength liquid from the paste, you will need to melt the paste in the microwave or stovetop without adding water. The convenient reservoir on the super shot bottle makes measuring the liquid quick and easy. No matter what version of Quick'n Brite you are using, it is the best cleaner available. Paste Container Sizes 12 oz. Liquid Container Sizes 32 oz. Quick 'n Brite Starter Kit - Clean anything you can get wet with water! Quick n Brite is a highly concentrated, environmentally safe (phosphate-free) organic solvent for all your cleaning needs. Whether cleaning floors, autos, windows, or even your pet, it is perfect for any job! Quick n Brite took away a nasty carpet stain. The shampoo was wonderful with no annoying fragrance. I intended to use this product to see if it would work on some very old, bad and ugly brick scorch or burn marks on the frame of our fire place. We wanted to replace the door and screen but some if the styles that I liked have a slimmer trim which would expose the burn marks. I wish I had taken pictures to share with this post because the result surpassed all my expectations without reservation. I started with the kit of liquid and a small tub of paste. I've since cleaned my no wax floor that looks like slate with all the little grooves in it just like real slate does.... what a wonderful result! I most likely will never buy any other cleaner. I've not seen a down side to this product . I read all the instructions, boiled water, applied the cream, waited! 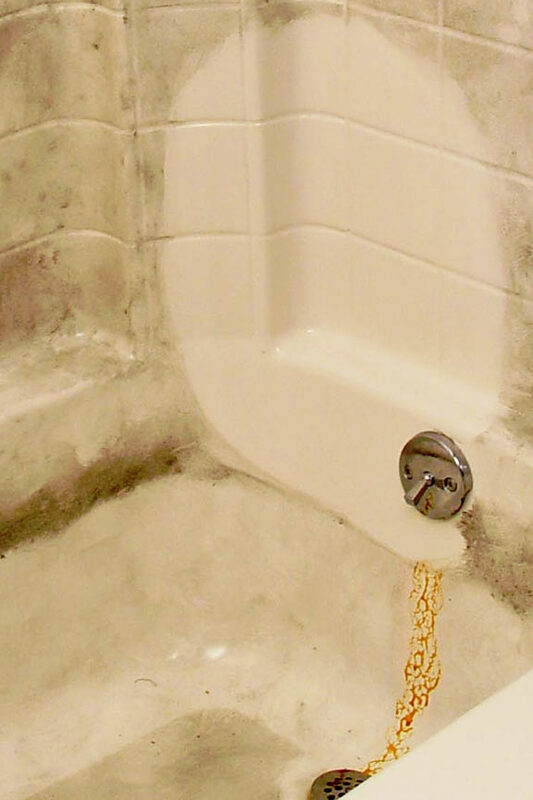 The top part of the shower door looks better, the bottom part still has the heavy water stains. I scrubbed for an hour to try to eliminate them, there still there! you have created something good, I am a 3x stroke victim saved by the Grace of God and I spill or something often, Clean and Brite is wonderful! I used to sell this stuff and used it daily in cleaning hospital rental equipment. It would take off everything from ink to blood and left a light haze on stainless that left a beautiful luster once buffed off. I made this purchase to safely remove 50 years of soot on the front of a fireplace. After a simple test, I scrubbed the bricks. Upon rinsing and drying I have a new looking fireplace. Fantastic stuff. The materials you sent exceeding all of my expectations. It worked fantastic. Keep up the good work. I will say it does clean. But its not some miracle cleaner. Didnt get any colored stains out of carpet. The only special thing is there are no harmful chemicals, but I would take something with chemicals if it actually worked. simplygoodstuff response: Give us a call, or send an email with details on the stain you are trying to lift. It should take almost any stain out of carpeting, but technique will vary depending on what it is. We would be happy to help you get the results you expected. I love Quick'n Brite. It is safe to use and makes clean up easier for so many different chores. I have used it for a lot of years now and will always have some on hand. Great product and well worth trying. I don't typically believe ads or testimonials. Until now. I used quick n brite on my fireplace stones and wow! Highly recommend the product. I love that it's green and pet safe. Can't wait to try it on other things. Well, I have a house cleaning company and was really hoping this was something that I could use and I could get rid of all the other products on the market. However, I was really disappointed. This product is no better that anything else I use. Maybe at best a good all purpose cleaner. In my opinion did hold up to the test and I used this everywhere it said I could. Followed directions as indicated but stil not worth the money. I will not be ordering this product again and certainly feel I waisted my money and time. simplygoodstuff response: Sorry to hear of your disappointment. Please give us a call when you get a chance. We would love to help you get the results you had expected. I have used this for years. I am glad you now have it in liquid. I t does what is says it does. I ran out so went on line to buy more. 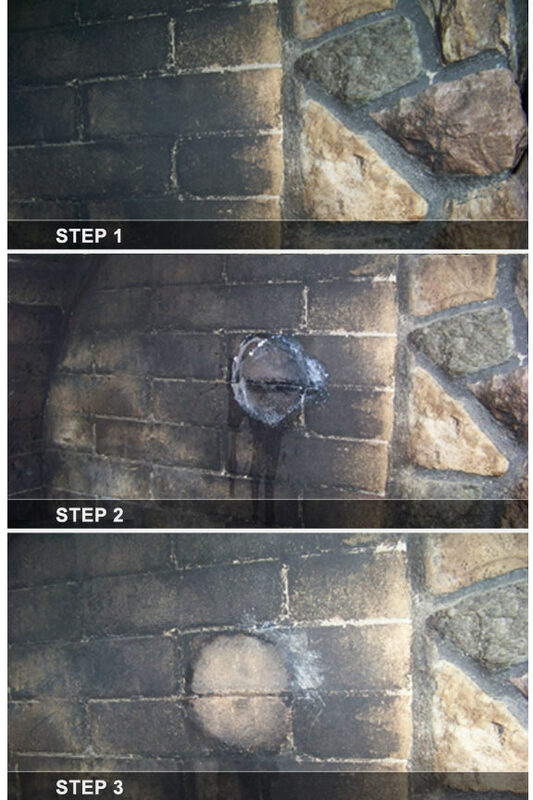 Can I use Quick n Brite on my Corning artificial stone that my indoor fireplace is made of? Yes you can. It will be totally safe and effective for that surface. We need to clean our stone fireplace. What Quick n Brite amounts would you recommend to start?